A group of thieves plot a cop killing in order to create a diversion for a heist. Perhaps a DVD release will offer an extended cut that irons out its issues and makes Triple 9 a more fluid and coherent watch, but until then we have a mostly rewarding old school crime thriller with a host of solid performances from a talented and diverse cast. Ensemble crime dramas were two a penny back in the post Reservoir Dogs '90s, but they found themselves relegated to the straight to DVD shelf in the '00s. Triple 9 is a return to the sort of star-studded thrillers that arrived in the wake of Tarantino's breakout, though thankfully the postmodern dialogue has been swept aside and replaced by a grittiness that's at times genuinely shocking. A five man crew - comprising former Special Ops agents Michael (Chiwetel Ejiofor) and Russel Welch (Norman Reedus), crooked cops Marcus Atwood (Anthony Mackie) and Jorge Rodriguez (Clifton Collins Jr), and Russel's unstable junkie brother Gabe (Aaron Paul) - pulls off a bank heist, targeting the contents of a specific deposit box. Despite Gabe's greed in stealing cash marked with red-dye almost scuppering the operation, the men use their professional know-how to pull off the job. It transpires the thieves are in the employ and under the thumb of Irina Vlaslov (Kate Winslet), a Russian-Israeli vixen running her mobster husband's business while he rots in a gulag. Irina has been using Michael's crew to collect material that will aid in having her other half released to Israel, and she has one final job lined up for Michael - stealing files from a secure government facility. At first, the men dismiss the job as impossible, but then Marcus and Jorge strike upon an idea - kill a cop to create a diversion that will keep every cop in the city occupied. 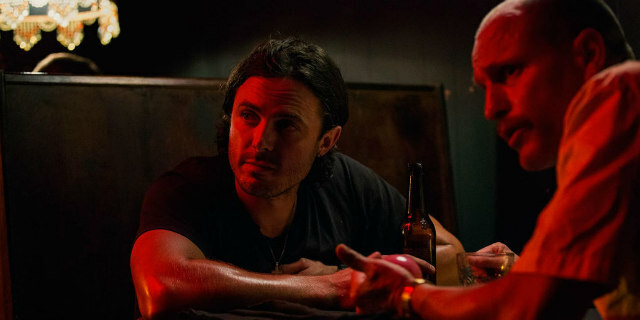 The intended victim of their 'Triple 9' killing is Chris Allen (Casey Affleck), a cop freshly transferred from the suburbs. 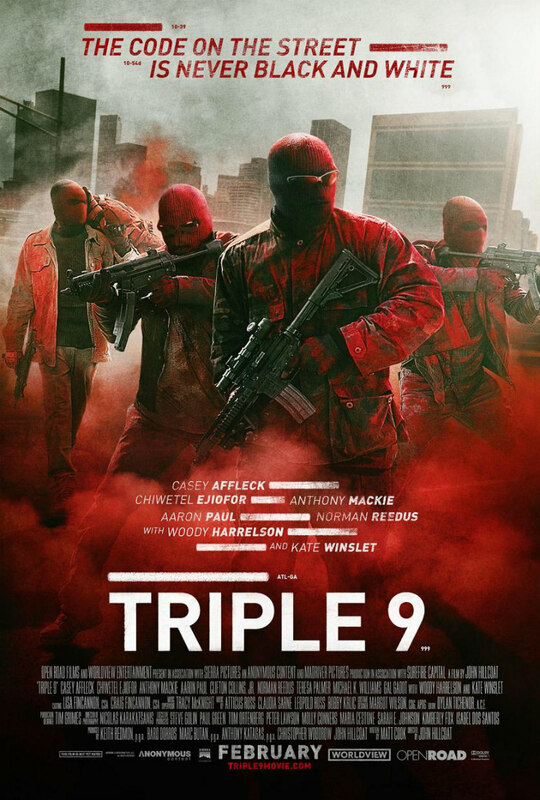 Triple 9 is the latest crime thriller to employ the premise of having its protagonist unknowingly manipulated by those he places his trust in. It doesn't pull it off with the same aplomb as Metro Manila or Sicario, chiefly because Affleck's naive cop isn't given enough screen time; the movie doesn't really have a protagonist, with Affleck, Mackie, Ejiofor and Harrelson's grizzled detective sharing almost equal screen time. But while we never quite become emotionally invested in a specific character, the plot itself, with its various twists and turns, is enough to draw us in. 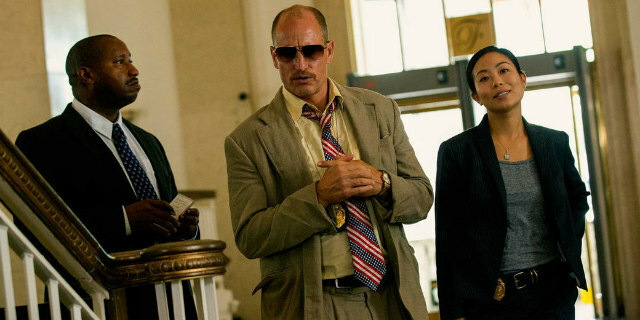 As you might expect from the director of The Proposition, The Road and Lawless, Triple 9 doesn't skimp on the grime and violence. Gang members' severed heads are left displayed on car hoods, bombs made from cellphones are detonated while strapped to victims' ankles, and bags filled with extracted human teeth hint at the extent of Irina's ruthlessness. While it's overall a satisfying watch, the movie does feel like it's been somewhat cut down, and as such there are some points that feel muddied. The relationship between Michael, Irina, her sister Elena (Gal Gadot) and Michael's young son could have been made a lot clearer a lot earlier, and it's never established exactly when the movie takes place, with '00s era flip-phones appearing alongside 3.5" floppy discs. In the opening heist, Collins Jr takes the imprint of a female clerk's lipstick on his handkerchief, for reasons never later explained. Then the police are told the robbers spoke Spanish, yet we heard them speak English throughout the heist! Perhaps a DVD release will offer an extended cut that irons out these issues and makes Triple 9 a more fluid and coherent watch, but until then we have a mostly rewarding old school crime thriller with a host of solid performances from a talented and diverse cast.